A northwoods retreat in the footprint of the Milwaukee metro area, Camp Bar taverns fully embrace the style of the Wisconsin wilderness. Hand-sawed logs and woodwork create a lumberjack aesthetic that’s enhanced by built-in fireplaces and woven wools and flannels. Great style combined with great drinks resulted in Camp Bar being named one of “America’s Best New Bars” by Details in 2012. 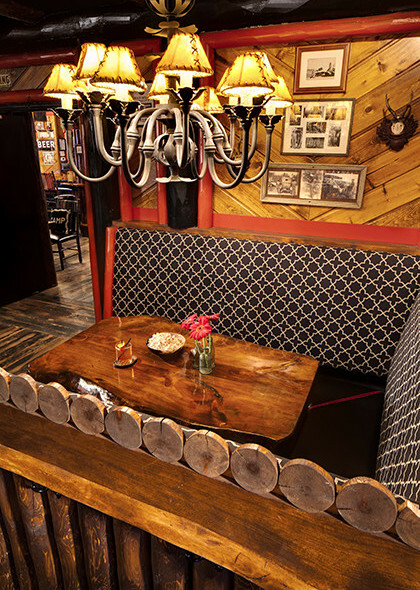 Modeled after the owner’s cabin, the three Camp Bar locations are an ode to the culture of the northwoods. Taxidermy, antler sheds and other knick-knacks are abundant at both locations, sourced from the client’s collection and our designer’s travels.